When the Netflix series “13 Reasons Why” premiered in March 2017, it quickly became one of the most watched—and most controversial—shows of the year. It was no surprise that the news of Season 2’s May 2018 release continued to get a lot of attention. The drama-mystery centers on a high school student who commits suicide and leaves behind 13 audiotapes for people she blames for her action. Season 2 picks up as the community tries to deal with emotional and legal fallout from the suicide. Fans of the series say it increases much-needed awareness about teen suicide, which is currently the second leading cause of death for children and young people 10 to 24 years old. In addition to graphic portrayal of suicide, the show also focuses on bullying and cyberbullying, underage drinking, sexual assault, guns in the home, and other topics that can serve a tool to start discussions. Medical and mental health professionals also report teens listing their own 13 reasons why they wanted to kill themselves. Some families say they believe the show triggered their children to actually take their lives. Presenting suicide as a tool for accomplishing certain ends, such as revenge or recognition. Glorifying suicide or persons who commit suicide. The series is rated TV-MA (Mature Audience), appropriate for ages 17 and up, for its graphic violence, explicit sexual activity and crude language. But school officials and pediatricians say they’re learning of children as young as elementary-school age who are binge watching the show—sometimes without parents knowing, because it can be streamed privately on their phones, tablets, and computers. Parents are often surprised to find out their child has watched the series. As a parent, it is your job to counsel your children and teens about smart and safe media use. Dr. Breuner said she also asks her patients (and their parents) how much time they spend on screens and what shows they watch. Parents should be aware that their child may hear friends talking about the show at school or on social media—even if they haven’t seen it themselves. Regardless, Dr. Breuner said the series is “absolutely inappropriate” for children under age 13. If you haven’t watched the show, look up episode summaries and be prepared talk with your child about the ways fictional shows don’t always reflect reality. Use the show as an opportunity to talk with your child about the very real situations teens face—and how your child can come to you with anything he or she may face in the future. Despite concerns about ’13 Reasons Why,’ the show can serve as a powerful teaching tool with informed, adult guidance from parents, teachers, spiritual leaders, and others who work with teens. Children in groups at a higher risk for suicidal thoughts and actions should not watch the show alone, Dr. Breuner said. This includes kids with a family history of suicide, a history of physical or sexual abuse, mood disorders, and drug and alcohol use, and/or those who identify as lesbian, gay, bisexual, transgender or questioning. Discuss reality vs. fiction. Explain that the show gives an unrealistic view of the help available for teens who may feel suicidal. In particular, the lack of effective mental health care provided to lead character, Hannah Baker, is both troubling and unrealistic. 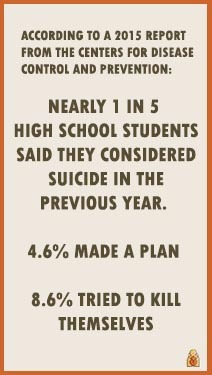 Statistics show that a large majority of the time, teens with suicidal thoughts and behaviors are in the grips of treatable mental illnesses, such as depression. In the show, Hannah voices clear suicidal warning signs to her school guidance counselor. Yet, the counselor failed to connect her with other professionals and resources for help and told her simply to “move on.” Critics say this sends a dangerous message that adults can’t help. Play it safe. If your teen does watch the show, make an extra effort to watch him or her a little more closely afterwards—in a mindful, nurturing way. Know the signs of depression, such as withdrawing from friends or family, eating or sleeping less or more, or losing interest in activities. If you have a gun in your home, make sure it is stored unloaded and locked up separately from ammunition. Studies have found the risk of suicide is 4 to 10 times higher in homes with guns than in those without. And although Hannah Baker uses a different method to end her life, suicide by firearms is now the second leading cause of death among teens 15-19. More than 80% of guns used in teen suicide attempts were kept in the home of the victim, a relative, or a friend. Provide access to help. Give your child su​​​ggestions for whom he or she can turn to in times of need—including you, as well as other trusted adults. 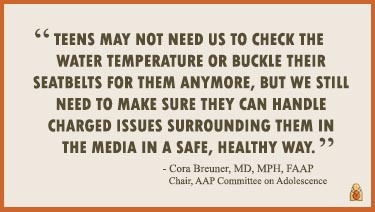 Your pediatrician can also help. The American Academy of Pediatrics recently recommended all children over age 12 be screened for depression at their annual wellness exams. For any immediate concerns about your child, call the National Suicide Prevention Lifeline is 1-800-TALK, or text START to 741741. It may feel uncomfortable to talk with your teen about some of the difficult issues raised in “13 Reasons Why,” but talking about tough topics with teens is every bit as important as making sure a baby’s bath water isn’t too hot. Remember to talk with your child’s pediatrician if you have additional questions or concerns about your child’s media use or mental health.